On December 10,1975 our chapter was organized and named after Mrs. Hazen Mackay, a leading spirit in IODE Saint John, New Brunswick .We focus on Service and Education in our community. We have three main fundraisers a year .A fall luncheon card party ; a spring Italian dinner and supervise the Home Economics exhibits at the Saint John Exhibition in the summer. We are a very welcoming,friendly group of ladies that are very active in our community. We are very involved with our assisted school ,Centennial.We regularly take nutritious snacks to the students . Three of our members are involved in the ELF program and we attend oral reading events with the students. We also have an adopted school in Labrador and we send school supplies yearly.We have good communication with both of these schools and enjoy working with them to improve their education. In the photo above we presented Crescent Valley Resource Center with over 300 books for their adult and children's library. Our motto is " Service to others ".We support Hestia House, a battered women's shelter;Bobby's Hospice, a home for terminal patients;Romero House,a food kitchen;Crescent Valley Resource Center, and support two families at Christmas through the Christmas Exchange. Linda MacKenzie has been our dedicated Standard Bearer for many years. The flags are always present at every meeting, Remembrance Day Services or wherever she is called upon to serve. We give two students books at our assisted school as citizenship awards. 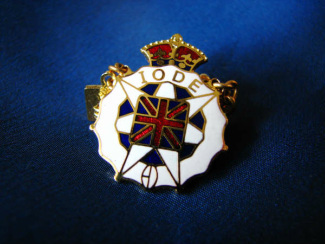 It has been my pleasure to be President of Katie Hazen Mackay Chapter IODE for the past three years. The women who belong to this group work extremely well together and offer each other so much support. We are twenty five strong at this time with all individuals coming together whenever they are needed. Our group is composed of several original members (charter members), members with a great deal of service and those who are a newer group of ladies. Individually everyone has some skill or talent to contribute; collectively the group is strong. I am so proud to be part of this industrious chapter and whose members I can count as friends.